Bait consisted of some dead maggots, a pint of casters to go through the feeder and to prime the margins. I knocked up a small amount of dark F1 groundbait and had prepared a number of pva t-bags with both 4mm and 6mm pellets. 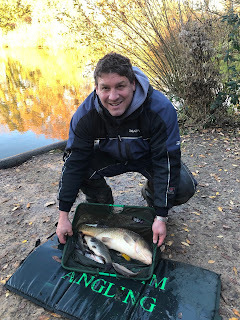 Today's match strategy was definitely based on a negative approach, PVA T-Bags and mini hybrid feeders with very little on the side tray too. First cast was the t-bag to the dam wall around 2/3 distance of my half of the lake. The stopwatch came out and I'd leave this in the swim for 30 minutes. Bait was a large 10mm drennan bandit dumbell. The mini method came out with a small 6mm drennan bandit dumbell. The response was immediate with a lovely roach in the net, quickly followed by another one and then a small chunky carp. I was casting shorter down the dam wall to a bush at a 45 degree angle to my seating position. Three quick fish and then nothing for the next 15 minutes. 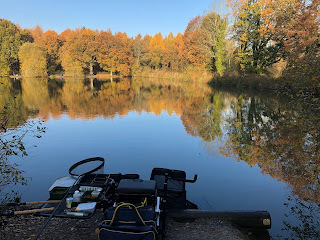 I needed to get some fish so I'd have to get my head down and put some silvers in the net, the quickest way would be the waggler. I chucked the bomb and t-bag rod out to my peg limits and closer to the bank while I set-up the waggler. Just finished plumbing up and getting the float shotted ready for the hooklength and the tip rod flew round. Fish most definitely on, it was taking line and plodding away from me! 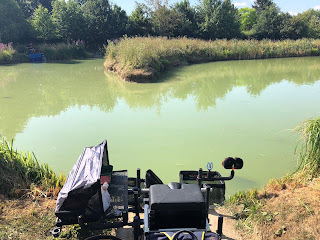 It was a decent fish and had the potential to be a very large fish at that given some of the creatures in this lake. The battle continued. The new Tricast Excellence feeder rod was performing very well, another 5 minutes and eventually the net slipped under a lovely common carp. 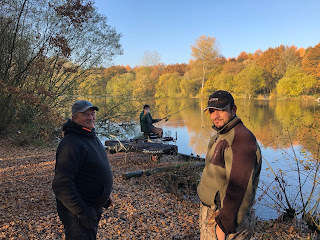 It was nudging 10lb so I gave Trevor a shout next door to witness the weigh as the rules dictate fish over 10lb need to be weighed and then released. 9lb 8oz of lovely common carp, so back in the keepnet it went for the catch shot at the end of the match! I went back on the t-bag line in the hopes of another fish however the tip never moved so it was back to the waggler line plan. 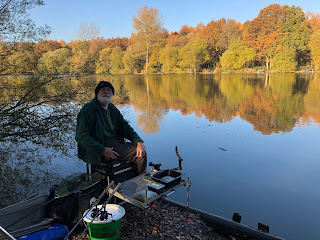 I fished the waggler until the final hour of the match and was regularly getting some silvers including a couple of hybrids although nothing of stamp. The final hour I started to mess around in the margins in the hope of getting some more carp which unfortunately never happened. 14lb 6oz for the section win and third overall. Well done to Paul Davies for 19lb from peg 21 for the match and his bank section win. 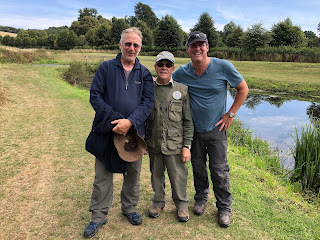 Obviously the large carp helped my weight and final result. 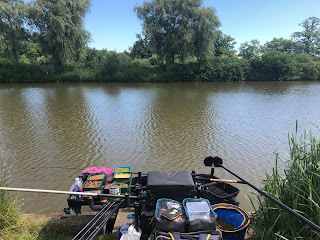 Going onto the waggler line while fishing for 'bits' certainly showed what can be achieved on a tough day with just under 5lb of silvers for my efforts, plus it was really good fun fishing the waggler to be honest. One of the lakes resident large bream turned up for Ian on peg 3. All five and half pounds of it! It will be great to see those fish out on a regular basis. Next match at Badshot Lea Little Pond.